Thanks for visiting our website! Established in 2000, Runtianzhi is a China-based inkjet printer manufacturer. We are able to provide you with a variety of UV roll to roll printer. 1. Konica Minolta printheads are employed in this UV roll to roll printer and the number of printhead can be either 4 or 8. 2. The printing color ranges from 4colors (CMYK) through 5colors (CMYK+W) to 6colors (CMYK, LC, LM). 3. 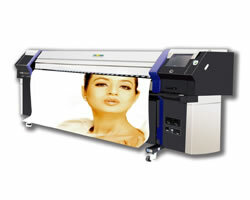 The highest printing speed is 55sqm/hr and the mixmum printing width is 3.20 meters. 4. It is applicable for printing on roll materials. 5. The highest printing resolution is 720 x 1440dpi. This UV roll to roll printer can create high definition images featuring good resistane to water, UV and scratch. Hence, it is ideal for printing on corrugated paper, foam core, PVC, ceramic tile, synthetic glass, wood, metal sheet, paper, advertising banner, mesh fabrics, and adhesive vinyl, etc. To meet the market demand, we also produce a variety of eco solvent printer and color inkjet printer which can be used as plastic panel printer, wood printer, wallpaper printer, etc. All of our inkjet printers have been CE, UL and FCC certified, so you can feel secure in using them. If you are looking for a reliable UV roll to roll printer manufacturer, please don't hesitate to contact us! Runtianzhi will be your right choice. Note:The above information is subject to change without prior notice.